Doug Ba'aser, Elizabeth T. Murff, Kevin Bee, Jeff Jones, Janine Klein and Josh Paul. When last we heard from Jeff Jones’s Satan, he was safely in a most peculiar Hell, one visited by God and populated by Hitler and the IRS. But in the third installment of Jones’s Welcome to Hell series, Satan has made it to Heaven, and I’m sorry to say the trip has done him little good. In Heaven Help Us!, Elizabeth T. Murff is still an old-lady God with an over-exaggerated Long Island accent, and Jones is still a self-assured devil with more than a few tricks up his sleeve. But the cast of characters has changed a bit. 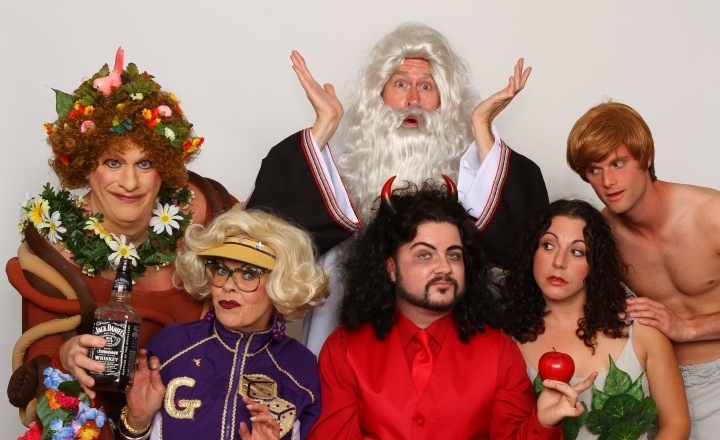 For this particular occasion — Jesus’s birthday party — Doug Ba’aser plays a foul-mouthed Mother Nature, Kevin Bee is a put-upon Moses, young and buff Josh Paul turns up as Adam and Janine Klein is a whiny Eve. This time around, though, Jones’s script is full of groaners (or jokes so pale they don’t even qualify as groaners), so that this resourceful cast has little to work with. Ba’aser’s timing is so good that he can make even the lamest line funny; Bee adds a lot to a surprise character with a mile-wide smile; and the show opens winningly with a visit from two scary real-life Orlandoans. But all too often, those actors and the others are left with little to do. And when Heaven Help Us! winds up 20 minutes early, and then falls into a pallid, lip-synched production number, you don’t have to wonder. Jones’s trip to Hell — and Heaven — seems to have run its course. Friday May 20, 11 p.m.
Saturday May 21, 5 p.m.
Monday May 23, 9 p.m.
Wednesday May 25, 5:30 p.m.
Thursday May 26, 8:30 p.m.
Friday May 27, 6 p.m.